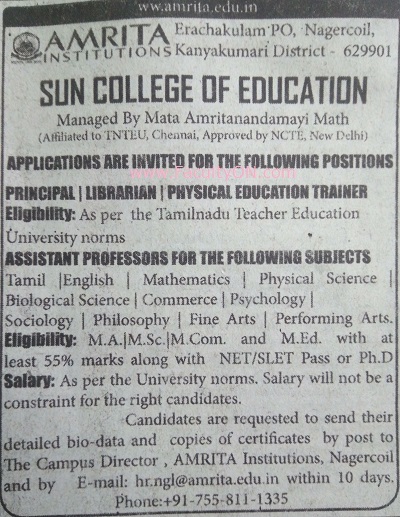 SUN College of Education, Nagercoil has advertised in the DINATHANTHI newspaper for recruitment of Assistant Professor / Principal / Librarian / PET jobs vacancies. Interested and eligible job aspirants are requested to apply within 10 days from 16th Sept 2018. Check out further more details below. About College: Mata Amritanandamayi Math (M.A.MATH) has established a new technical campus in Nagercoil with state-of-the-art infrastructure, well-equipped laboratories with updated equipment, high-speed internet connectivity, modern library, etc. M.A. Math is founded by the Hindu spiritual guru Mata Amritanandamayi Devi, who is known popularly as “Amma.” MA Math has established a vast network of educational Institutions across the country that offer professional education of very high standard and these Institutions are ranked top in India and abroad. How to Apply: Interested and eligible candidates are requested to send detailed CV, copies of certificates and recent PP size photos to the postal address and email address mentioned below.